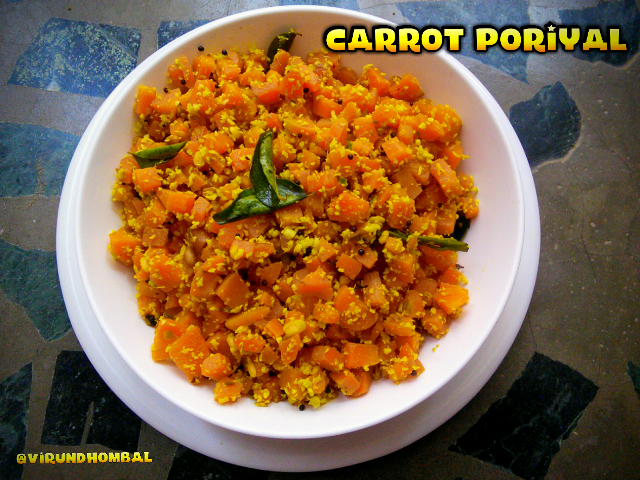 Carrot poriyal is also similar to my other thuvaram/poriyal varieties. 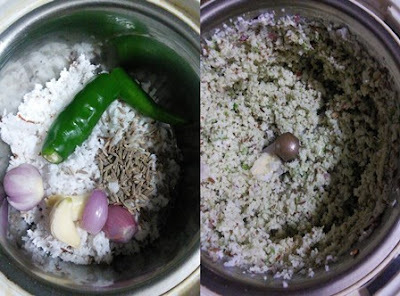 It includes simple ingredients like coconut, small onions, green chillies, cumins and other tempering ingredients. For this poriyal, you can add cooked green peas or black eyed peas. 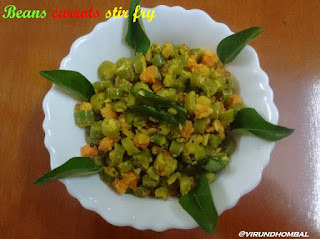 I always recommend to cook the vegetables with little water and then sauted with the mustard and urid dal and ground coconut mixture is added for flavours. The ground coconut paste adds lot of flavours to any poriyal or thuvaram rather than garnishing with few grated coconuts. This carrot poriyal is a good side dish for sambar, puli illa kuzhambu, lemon rice and coconut rice. 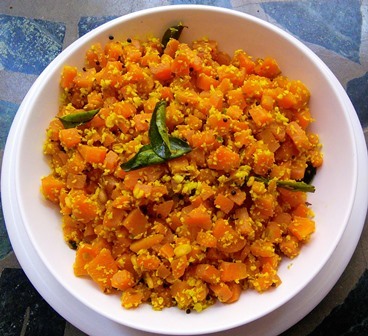 This carrot poriyal is a best side dish for sambar, puli illa kuzhambu, lemon rice and coconut rice. Wash the carrots and peel the skins gently. Cut them into small cubes. 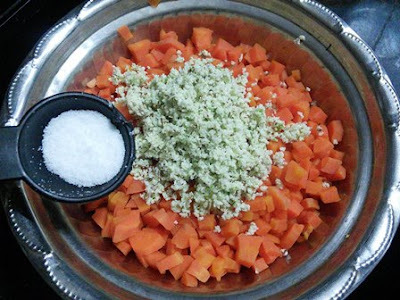 Take a small chutney jar and add the grated coconuts, green chilly, small onions, garlic cloves and cumin. 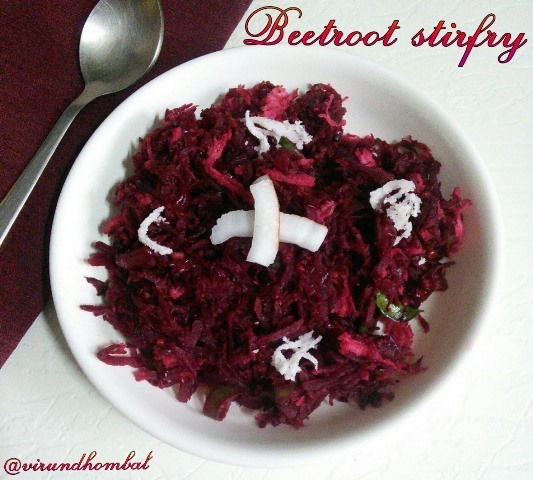 Whip them or grind them without any water coarsely. 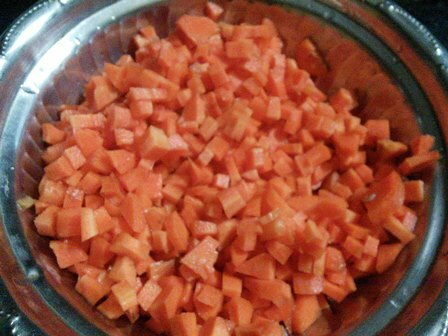 Add the chopped carrots in a vessel and pour 1/4 cup of water. Cook the carrots on medium heat until soft. When they are cooked well, transfer it to the bowl. Now add the required salt and ground coconut mixture. Mix them well. Heat oil in a pan and add the mustard and urid dal. 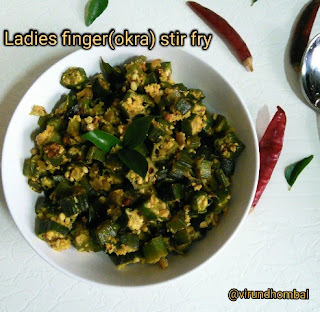 Allow them to crackle and add the curry leaves. 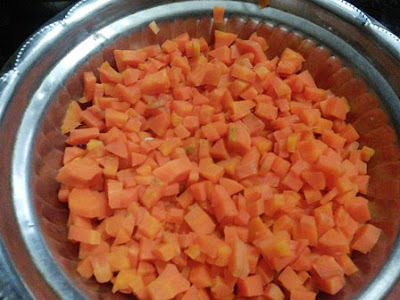 Add the mixed carrots to the pan and stir them well until it becomes dry and transfer it to the serving dish. 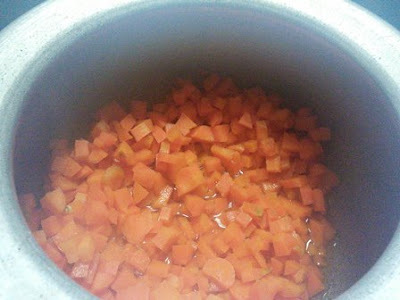 Add the chopped carrots in a vessel and pour 1/4 cup of water. Cook the carrots on medium heat until soft. When they are cooked well, transfer it to the bowl. Heat oil in a pan and add the mustard and urid dal. 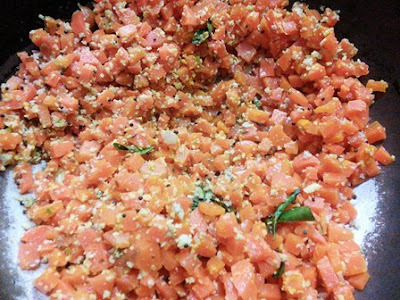 Allow them to crackle and add the curry leaves. Add the mixed carrots to the pan and stir them well on high heat for a few minutes, until it becomes dry and transfer it to the serving dish. Yummy and tasty Carrot poriyal is ready to serve. Enjoy this Carrot poriyal for sambar, rasam or puli illa kuzhambu. If you try this recipe for Carrot poriyal send us your comments below and share the recipe for your friends and family.